The Carey High School varsity volleyball team captured its first 1A Division 2 conference win of the season Tuesday 22-25, 25-22, 25-17, 25-13 over Murtaugh’s Red Devils, on the Carey floor. Coach Kathy Whitworth said the Panthers (3-2, 1-0) summoned some energy after a slow start led by the serving of senior Kylie Castle and the hitting of junior Medin Cenarrusa (12 kills, 13 digs). Junior Hailee Johnson’s underhand serves be-deviled Murtaugh as she obtained seven points for Carey down the stretch. Other contributors included Natalie Villanueva (8 kills, 13 digs), Castle (15 digs) and Paige Koudelka (15 digs). Carey’s team hosted Rockland’s Bulldogs for its Homecoming match Thursday. · Wood River’s varsity volleyball team had a tough Great Basin Conference opener Tuesday, playing on the home court of three-time defending league champion Twin Falls. The Bruins prevailed 25-18, 25-17, 25-18. Leading Wood River were sophomores Blair Radford (5 kills, 2 digs) and Michelle Mason (4 kills, 5 digs). Wood River (7-5, 0-1) played at Canyon Ridge in Twin Falls Thursday and hosts Jerome for its home opener and Homecoming match Tuesday, Sept. 16. · At the Fish Tank Wednesday, the Community School Cutthroats dropped a 25-8, 25-9, 25-23 league match to Murtaugh. 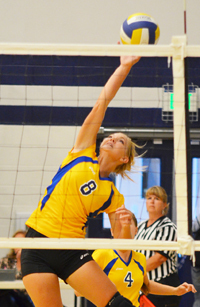 Host Twin Falls Christian defeated the Cutthroats 25-12, 25-19, 25-16 Monday.